Recently a Prison Chaplain reported, "We showed the film to approximately 350 inmates (Christians, Muslims, atheists, Black, White and Hispanic) at the Indian Creek Correctional Facility, Chesapeake, VA. Normally, when we do something like this with this many in attendance, there is a lot of talking and shuffling about. We work with these guys every week and I know how tough many of them are to reach. But while the film was being shown we were amazed because there was absolute silence in the entire auditorium for 45 minutes. You could have heard a pin drop. When the film was finished the entire group spontaneously stood up with a standing ovation. I saw quite a few with tears in their eyes. I have never seen anything quite like this before. In this prison we deal with a few men who are philosophers and thinkers. They love to debate everything. After seeing the film, they told me that they were blown away by the message of this film. They want a copy of the film for their library. I am sure that it will be watched many times. Based upon this single experience, I am confident that this Return To Glory film will have a positive impact in every prison across America." An educator said, "...it fills a void in knowledge for all. The film was very accurate with the history and everyone can learn something, regardless...very inspirational." Endorsed by such notables as Bill Cosby, Julius Erving, Ben Carson, Joe Frazier, Tony Campolo and Tony Evans, RETURN TO GLORY: THE POWERFUL STIRRING OF THE BLACK MAN has been enthusiastically received by an international readership from many regions including: West Africa, South Africa, North America, London, and the Caribbean. The visual, film version of the book is powerful! We welcome your financial help with this ambitious project, which includes plans to translate the film into French, Portuguese and Spanish. We will then raise the funds necessary to donate over 100,000 copies of the PAL video version of the film throughout the continent of Africa, Brazil, the Caribbean and parts of Europe . Contact Freeman and Griffin with your creative fund raising ideas. RETURN TO GLORY is the non-profit vehicle we have established to raise the funds necessary to distribute the video version to schools, prisons and juvenile detention centers. Put your finger on our "organizational pulse" as you read the bylaws. You can donate online below. An individual donor may want to have a special edition manufactured, with the corporate logo on the lower front corner of the DVD case. We can even include a special letter of introduction within the DVD case. Call us to discuss this option. We are happy to provide a link on our web site, pointing people to your organization's web site, recognizing your organization's passion for getting the "Return To Glory" message out. Every radio/TV interviewer will be told about the various corporate sponsors who made this possible. The sponsoring corporate logos/links will be on the web site returntoglory.org forever and also the logos of the corporate sponsors can be included on the front cover of a special edition of the DVD. Destiny Image Publishers will be the primary distributor of the film. Jeremiah Films, Lift Every Voice and Urban Ministries, Inc. (UMI, Chicago) will be some of the secondary distributors of the film. UMI currently serves between 30K – 40K African American churches with educational materials for all ages. There are a number of other regional and international distributors interested in non-exclusive distribution rights. We are open to your creative distribution ideas. Since this is a not-for-profit, charity model, no individual can or will profit from revenues that may or may not come in from potential video rentals, distribution rights, broadcast rights, etc. and there are no guarantees that any money will be realized on this video/film project. Keeping that in mind, 25 percent of rebroadcast rights will go to fund future film projects with a similar message made at the Regent University School of Cinema. Students interested in this type of film will earn the right to hone their skills and to give them work experience that will in turn help them become more marketable in the film industry. Our goal is to donate a special DVD version of the film to every juvenile detention center, prison and school (Middle, Junior High, Senior High, College, University) in America. Our youth need to be educated. We want to do our small part to help with this education. How can you help? In August, 2002 Dr. Freeman and Producer/Director Steve Alston traveled to West Africa to collaborate on a 2nd project tentatively titled African Kings: A White Man's Journey Into the Past, Present and Future of African Kingdoms. Freeman and Alston were given unprecedented access to many African Kings . The recorded interviews with these Kings that can only be seen in this upcoming documentary. To be released late 2003, this film combines tribal dances and stunning photography while addressing the past, present and future perspectives of the African Kingdoms. This project serves as a sister project to the soon to be released "Return to Glory" documentary. 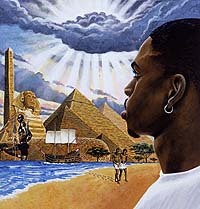 Renowned painter, Leonard Freeman painted the image used for the insert included in every video and DVD case. We are excited by his passion for these projects. -- How You Can Participate In This Project? 2. Because of the ongoing impact of the message of this film, your church can select Return To Glory to be a part of its "Mission's Budget". The money donated will help to distribute the special DVD version of the film to schools and prisons across America and/or across Africa. 3. Perhaps you can host an area-wide screening of the film, inviting a number of pastors and leaders to attend a screening at your church. You can encourage a number of churches to make Return To Glory a part of their annual "Mission's Budgets". A wonderful by-product springing from this type of screening -- the film can also serve as a tool for cross-cultural understanding and dialogue when various churches come together for such a purpose. 4. Your company/organization/family/sorority/fraternity/club can commit to making a monthly or yearly donation. 5. Ask some neighbors, co-workers and friends to come over to your home for a private screening of the film. See if they are willing to help with their prayers and financial support. 6. Make a contribution in memory of or in honor of someone dear to you. Please indicate a name and address of the individual to whom an acknowledgement can be sent if you would like the Return To Glory Foundation to do so. Dollar amounts are not included in the letters of acknowledgement. 7. Don Griffin and Joel Freeman are available to attend (schedule permitting) a limited number of regional film screenings (may be viewed as fund raising events). Contact them if you have some creative ideas you are confident can be implemented. Don or Joel can attend, making some remarks after the screening and then fielding some questions. Don and Joel are excited about your participation in spreading the message of Return To Glory. Thank you! Joel A. Freeman, Ph.D. & Don B. Griffin, M.A. "Ancient Egypt, Black History, Tut, Rosetta Stone, pyramids, pharaoh, Africa, culture, hieroglyphics, Nile"